And I get it! I had about a million when I started my nutritarian journey. Can you drink coffee on the nutritarian plan? I don’t personally drink coffee (never have), so this hasn’t been an issue for me. I think the good doctor has been worn down over the years to finally say you can have one cup of unsweetened coffee daily with a non-dairy creamer. For more specifics on this topic please head to Dr. Fuhrman’s article on coffee here. What kinds of beverages can you have on the nutritarian plan (tea, kombucha, juicing, etc…)? I personally only drink smoothies, fruit-infused waters (literally sliced-up fresh fruit or frozen fruit in plain water) and naturally decaffeinated tea varieties (like chamomile and hibiscus). Dr. Fuhrman supports drinking plain green tea, head to Dr. Fuhrman’s article on green tea here. The main concern is the effects of caffeine which is a known stimulant and the fact that people like to add sweeteners to their teas. What kinds of sweeteners should you avoid and which should you use? Nutritarians avoid all processed sugar and sweeteners. We also don’t use “natural” sweeteners like sugar (white, raw or otherwise), honey, maple syrup, stevia or agave. For a more in-depth look at the harm these sweeteners can cause, read Dr. Fuhrman’s article on natural sweeteners here. As a nutritarian, you want to get your sweetness from fruits and limited dates. The nutritarian’s dessert of choice is always fresh, whole fruits. Cooked fruits and dried fruits can be used in moderation depending on which form of the nutritarian plan you’re following. Date-sweetened desserts and sauces should be used sparingly with no more than 1 ½ medjool dates used per serving. Head here for or a great NutritionFacts.org video explaining why dates are the healthiest natural sweetener. I personally use dried fruit (apricots, raisins and currants), whole dates and date sugar (dried and ground up dates) as my sweetners of choice. Do you need to take supplements while following the nutritarian plan? Yes, especially if you intend to follow the aggressive weight loss plan, which is a vegan plan. At a minimum you’ll need to supplement vitamin B12 and D. You can read more about vitamins and supplements here and you can head to the Hello Nutritrian Shop for links to all the vitamins I use and recommend. If you’re serious about adopting this lifestyle and getting your health in order, I highly recommend you get baseline blood work done and ask your doctor to test your vitamin levels. This is helpful to see if you have a preexisting deficiency before starting the nutritarian lifestyle. Blood work is especially important for childbearing-aged women because iron deficiency can be a common problem. How much weight can I expect to lose on the nutritarian plan? I followed the 6-week aggressive weight loss plan at 100% and lost just over 21 pounds without working out. I came into the plan significantly overweight with a BMI of 30 (considered obese) and I was 30 years old. In Dr. Fuhrman’s Facebook Live session on fasting and intermittent fasting (from July 28, 2017), he gave a helpful breakdown of what you would expect to lose on the nutritarian diet if you were moderately overweight and followed the plan at 100%: You’ll lose up to 15 pounds in month 1, up to 10 pounds in month 2 and 8 pounds every month thereafter. Remember it slows the closer you get to your ideal weight. In all honesty, I believe Dr. Fuhrman is a bit too optimistic in his weight loss timeline. Over these past almost-6 years of helping readers through this lifestyle I’ve learned that there are SO many factors that play a part in weight loss. Two of the most important factors are how close you are to your ideal weight (a BMI under 23) and your age. The closer you are to your ideal weight the harder and longer it will take you to lose weight. And in the converse, if you’re coming into this program with 50+ pounds to lose, you’re going to see the scale moving much faster. The last 10 to 5 pounds for women can take a stretch of half a year or more of consistency to accomplish. But there’s no doubt about it, because I’ve seen it in my life and with countless readers, if you consistently eat nutritarian (at 95% compliance or higher) you will lose weight. The only wild card at play is: How long will it take your body to release that fat? It is literally only a matter of time. Dr. Fuhrman has a wonderful saying about trying to get your family on board with nutritarian eating when you’re just starting out with the lifestyle yourself: Put your oxygen mask on first before helping others. You want to focus on developing this lifestyle for yourself first before you bring the hubby, the kids, the dog and the next door neighbors on board too. Trust me, I get it and I love it–you’re excited and fired up! You’re bursting with new, life-changing knowledge and an enthusiasm to make ALL THE LIVES BETTER! But can I just tell you, from personal experience, it’s going to be a hard-fought process just to get little old you to fully integrate into this lifestyle. The last thing you want to be dealing with on day 8 is a house full of grumpy people who miss their processed foods, oil, sugar and salt and think that mom’s idea for the family to “go nutritarian” just plain stinks. Because let me tell you, you’re going to be dealing with your own inner voice urging you to give up, so the last thing you need is a tidal wave of this-is-just-too-hard-itis to knock you off plan. This will make all the difference to actually making change happen in your family. Let your hubby and kids see what you’re doing and learn about it over time in a natural way. Let them see you feeling more energetic, being happier and living your best life–that’s how you will win hearts and minds! Why don’t your recipes contain nutritional information? A big part of adopting a nutritarian lifestyle is to get out of the mindset of counting calories and macronutrients (fats, carbohydrates and protein). Instead you’re going to focus on eating large portions of high-nutrient foods. Count your colors instead of calories! Why do your recipes use tofu--I thought tofu was unhealthy? I eat tofu almost daily. In Eat to Live, Dr. Fuhrman lists it under the unlimited category (p. 216). I have lots of tofu recipes on Hello Nutritarian because it’s a great transition food when you’re just starting out in the lifestyle. It’s full of plant-based protein and can be made into versatile chicken-like strips or even tofu eggs! There is a lot of frightening information out there that has given tofu a bad wrap, especially here in the US (my hubby is Korean and to them tofu is just as normal as chicken). Please read Dr. Fuhrman’s article on the Myths About Soy here, to learn about all the studies and get your facts in order. How difficult are your recipes to make? A big reason I even started blogging about nutritarian living was beacuse I couldn’t find easy-to-make recipes that tasted good and met the aggressive weight-loss standards. I’m very proud of the simple to prepare recipes I’ve created over the years and I can’t wait for you try them out along your journey! How long have you been a nutritarian? I started my journey on January 28th, 2013. I remember the date because my youngest was exactly 6-months old to-the-day. Yes, I’m a nutritarian vegan. Not all nutritarians are vegan as Dr. Fuhrman allows up to 10% of calories to come from animal products. I personally feel best when I don’t eat animal products at all. Does your whole family eat nutritarian? No. I am the only person in my family who eats this way. My hubby and two kiddos are not nutritarians. Do I have #lifegoals for my kids to go nutritarian? You bet! But it’s just not in the cards for them right now. My hubby will typically eat nutritarian dinners with me and just add a good shellacking of hot sauce on top (yes, it’s highly-annoying). My hubby leans-vegan because he avoids dairy but he’ll still have 3 to 4 servings of meat during the week. My kids eat A LOT of raw and cooked veggies and fresh, whole fruits. Even though they aren’t nutritarians I know too much to not protect them as best I can. We are a cow’s-milk-free home and we limit the kids’ organic cheese consumption. I lead by example. If they ever complain about how much veggies they have to eat at dinner I just tip my giant salad bowl to give them a look. Then I ask if they’d like to have what mommy’s having–they don’t complain much anymore! We don’t do daily desserts in our house, the kids are excited to have fresh pears, pineapples, apples or berries occasionally with this chocolate almond dip. Do you have more than one fridge in your house? No. We only have one fridge that we all share. We are so basic, we don’t even have an extra freezer in the garage. How long do your preps last in the fridge? Cooked food: All the recipes I batch cook (that you can find in the Nutritarian Power Prep Program) are designed to last at least 9 days and up to 14 days when properly stored in glass containers in the fridge. Fresh produce: Each type of produce has a different shelf life. My strategy has always been to eat the produce that goes bad quickly, first. Then I know my sturdiest veggies like cabbage, spinach, carrots, radishes and such will be lasting me almost two weeks when properly stored. I will be sharing more detailed storage guides with you in early 2019, so stay tuned! 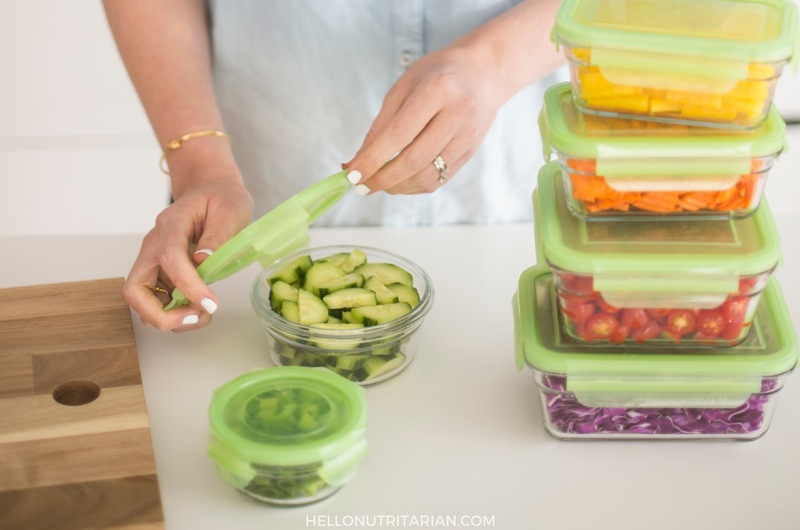 Are glass food storage containers better than plastic? Yes! Making the switch to glass containers has made all the difference in keeping my food fresher and longer in the fridge. For links to all the products I use and recommend head to the Hello Nutritarian shop here. Where do you keep your family’s non-nutritarian foods in the fridge? We all share pre-chopped raw veggies, chopped and whole fresh fruit, and salad bar preps for the week. That’s why you’ll see those items take up a lot of the main space in the fridge. Non-nutritarian foods are kept in the fridge deli drawer (that I pull out when I take my fridge pics) and in the in-door storage areas (that’s where my hubby has his extensive hot sauce collection) and the freezer. A long time ago I decided to organize my fridge in a way that makes my nutritarian lifestyle a priority. You can read all about that here and see pics of my non-nutritarian family’s foods too. It’s an LG French Door counter-depth refrigerator. We purchased it in 2013 and the model number is LFX25991. How do I get help with email sign-ups and receiving the free ebook "The 7 Day Salad Cleanse"? When you sign up for weekly emails from Hello Nutritarian you must confirm your subscription. This confirmation email will be sent to you after subscribing. After you confirm the subscription you will receive a “Welcome” email that will contain a link to download the free ebook. Make sure to check your spam folders as email service providers will frequently filter these out! What if I lost my copy of "The 7 Day Salad Cleanse"? You will have to wait until my next email is sent out. At the very bottom of each email there is a link to download The 7 Day Salad Cleanse. I recommend you store the file to a secure location like your laptop or desktop computer. I send out weekly emails, typically on Thursdays around 11 AM (PST). I occasionally take some time off but I’ll usually let you know in the previous email when I’ll be out of office. Make sure to at least open the email when you get it, we periodically purge our email list of readers who consistently do not open emails. At this time I do not offer personal coaching services. If you’re looking for additional guidance from me I recommend that you become a VIP reader and join the Nutritarian Power Prep Program. I answer any and all questions you have in our Facebook support group. And you better believe I’ll be cheering you along your 6+ week journey!